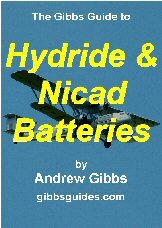 This revised and expanded guide is beautifully written and illustrated, and tells you how to get the best from the hydride or nicad batteries that keep your transmitter and RC system working properly. The guide contains over 17,500 words plus numerous clearly drawn diagrams, tables and charts. The 16 chapters are packed with comprehensive guidance about essential battery information topics such as fast charging transmitter batteries, discharging, ‘C’ limits, black wire corrosion, hints and tips and much more. Like all Gibbs Guides, it’s written and illustrated in a really clear and easy to understand way. Many informatively captioned photographs help to make this a really enjoyable and informative read. This essential modeler’s resource is a definite must-have for every modeler using hydride or nicad batteries, whether used in a transmitter, receiver or as a flight pack in a model. You can be enjoying your copy of this great value e-book in just a few minutes from now! Please note this is an e-book, NOT a paper book! This operating guide has been produced to supplement the factory-supplied instructions for nicad and hydride batteries. All possible care has been taken with the guide; nevertheless, customers use it and the information within at their own risk and absolve the author of any liability whatsoever in respect of personal injury, damage to property or any other kind of accident in connection with this guide. By ordering this guide, you indicate that you accept these terms.